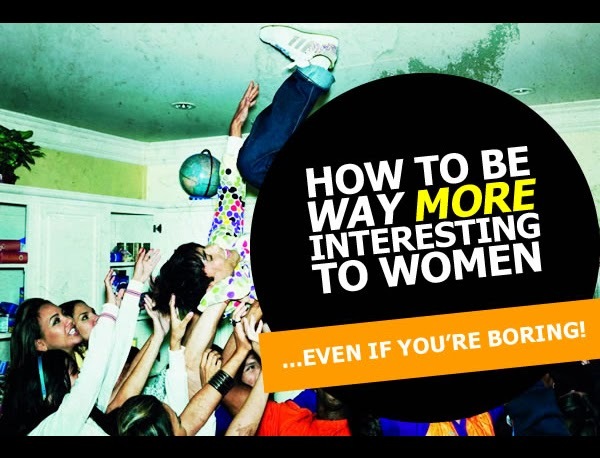 1) Understand that becoming a more interesting person is a process. Therefore patience is involved. It doesn't happen overnight, nor should you expect it to. Focus on who it is you want to become in six months versus training for tomorrow's game. Be disciplined and start building the habits today that will be with you a lifetime. What makes you a more interesting person? 2) Read. Read. Read. The more knowledgeable you are of what is going on in the world, whether it be history, sports, or just life in general, the more you can draw from in your conversations. One of the best ways of keeping up-to-date with the latest news is reading the newspaper. Alternatively, you can be subscribed via a feed to interesting blogs. 3) Discover your passion. There is nothing more interesting than a person who is passionate about something. When you are passionate about something you will naturally exude confidence and excitement. That excitement is contagious and others will be inspired by your enthusiasm. Even if others do not share in the same passion, you'll find most people are intrigued by what captivates you. If you aren't sure what you are passionate about, get out of your comfort zone and try new things. Best way to be interesting? Be someone who is interested in life. 4) Workout. Studies have shown that those who exercise are more alert during the day and actually get more done during the day. Another benefit towards working out is just the pure discipline it requires to go to the gym day in and day out. Be motivated to change your life. You'll be able to carry this disciplined to other aspects of your life. Being fit and exercising will ultimately raise your confidence, which will seep into your daily life. 5) Develop a great circle of friends. Not only is this a great way to share your knowledge, it is also a great way to keep up to date with the latest happenings. Having a diverse set of friends lends you to consider different personalities and helps you learn to interact with different people. 6) Go to more places so you can recommend better places. While most of us Yelp things, everyone understands that reading about something and actually being somewhere are two different things. Furthermore, just because someone else says something is great does not mean you will think it is great. While it may be likely that may be the case, there are plenty of times when my friends had an opinion about a certain place that I disagreed with. It's not a one size fits all, so it's better to experience things. 7) Have something that gives you a diverse range of interests versus watching Game of Thrones every Sunday night. Pick up a hobby whether it be eating and blogging about fancy restaurants, painting, or playing a new sport.